We are aware of yoga’s immense potential as not only an exercise regimen, but a healing modality. Yoga is no longer an obscure or new age trend, but a practice that is used and accepted the world over. These days, hip yoga studios have popularized yoga with the in-crowd, doctors have tested and recommended it for a multitude of health conditions, purists can still find their spiritual yoga niche, and schools are even rolling out yoga and meditation programs for tiny yogis across the country. Yoga has its obvious benefits. But yoga is a holistic practice and many of our beloved poses have even more benefits than we could imagine. While we can guess at the strength that plank pose may develop or the balance improvements that regularly stepping into tree pose will give you, these and other poses may also help with brain development, mood, and circulation. Read on to learn all about the unexpected benefits of 10 popular yoga poses. Forward fold is an obvious choice for stretching the entire back of the legs, as it opens the hamstrings and calves. Forward fold is often used to help stimulate the brain as well, as you dip down and blood rushes to the head. You may not have realized that this pose also helps to stimulate blood flow to all the organs of the abdomen; it flushes the liver, intestines, kidney, and spleen and invigorates the entire body. How To: Take a deep breath in, then on the exhale, swoop your arms to your sides. Bend slowly downward, one vertebrae at a time if possible, and come into forward fold position. Touch your toes, shins, or knees, depending on what is comfortable for your body. You can grasp your elbows and allow your head to hang free. Take several breaths in forward fold. Return to standing gradually, again one vertebrae at a time. Cat-Cow is a beloved pose that can be done any time to help improve energy and flex the spine. But did you know that Cat-Cow can also help to improve coordination and calm the mind? Use this pose to refresh your mind during long working hours or when you need a boost of inspiration. When considering the chakra system, there are deeper spiritual benefits to this common pose. Cat-Cow opens up the second chakra which is related to connection and inspiration. When this center is blocked or stuck, it can be harmed to find your inner source of inspiration or find joy in life. Cat-Cow helps to release this blockage and restore free flow through the body. How To: Rest on your knees, hip width apart, and place palms firmly on the ground underneath your shoulders. Come to a tabletop position. Exhale slowly and fully, and roll your back to the sky, tuck your chin to your chest to come to cat. Inhale slowly and arch your back, bringing your navel to the ground, lift the head high to look at the sky. Repeat cat and cow 5-8 times. Downward Dog is part of nearly all yoga sequences because of it’s versatility. This pose can improve back, arm, and leg strength all while providing a rest or transition in between other asanas. Because Downward Dog is also an inversion pose, it brings healthy blood flow and oxygen to the brain. This helps to ward off fatigue, headaches, and moodiness. How To: Come to a tabletop position on hands and knees. With hands firmly planted and toes on the ground, stretch the knees and raise your bottom to come to Downward Dog position. Start with the knees slightly bent and heels off the ground, then exhale and slowly straighten the legs bringing the feet fully to the ground if possible. Rest here for a few breath cycles. Warrior II is well known for it’s ability to stimulate the muscles of the legs and back. When we think of the Warrior poses, we often think strong and fierce – and that’s exactly how Warrior II can make you feel. In fact, all of the Warrior poses are fabulous for improving your sense of self, determination, and confidence. They align your posture and promote balance and strength. How To: Begin in a standing position or Mountain pose. On an exhale, step your feet about 3-4 feet apart. Raise your arms and extend them out to the sides, parallel to the floor. Reach through your fingers to lengthen them further. With your heels on the same line, turn your right foot out to the right slightly and the left foot to the left 90 degrees. Bend the left knee over the left ankle while pressing into the right heel for stability. If possible, bend the left leg until it is parallel to the ground. Slightly stretch the left arm forward without moving the torso forward. Rest here for several breath cycles, steady and confident. Repeat on the right side. Triangle pose is a great asana for practicing balance and stretching the entire side-body. Triangle pose also has some secret benefits that lie deeper than the surface. This is an amazing pose for stimulating and regulating the entire digestive system. In this pose, we bend, massage, and flush the digestive organs like the stomach, spleen, pancreas, liver, and intestines. This helps to improve overall digestion and waste elimination. How To: Begin in mountain pose, then step your feet out 3-4 feet apart. Stretch your arms out to your sides, parallel to the floor. Actively reach them outwards to lengthen. Turn your left food inwards slightly, then your right at a 90 degree angle to the left. They should be along the same line. On an exhale, move your torso over your right hip, making sure to move from the hip and not the waist. Drop your right hand to fall at the shin, ankle, or floor next to the right foot and bring the left arm straight up overhead. Gaze up at your left thumb and rest here for 3-5 breath cycles. Repeat on the opposite side. 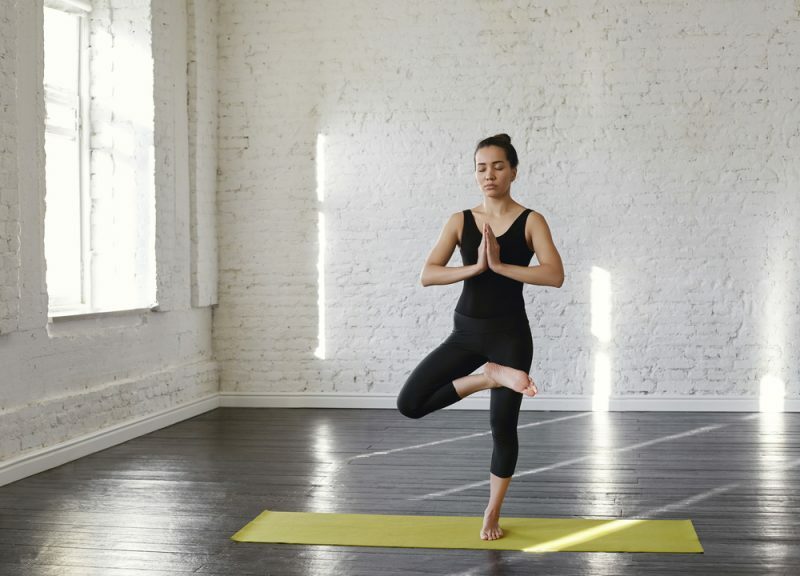 Tree pose may be one of the best known poses for balance and concentration. The pose lengthens your body and enhances your focus. Did you know, however, that tree pose can also improve your breathing? The elongated torso you achieve while in Tree pose helps to open a collapsed chest (common after a long day of computer work, driving, or poor posture) and provide your lungs ample room to fill to capacity. Use this post to practice deep breathing, expanding all the way down to the belly, open the chest, and calm the mind. How To: Stand tall, with feet firmly on the ground such as in mountain pose. Slightly shift your weight on to the left foot, and lift the right foot. Grab your right foot and place it on your inner left knee, thigh, or groin (whichever is most comfortable for you). Center your pelvis over the left foot to maintain balance, and look straight ahead. You may now bring your hands togetherat the chest and breathe deeply while focusing your attention to the heart and chest. You may also lift the arms above your head for a different stretch. After 5-10 breaths, slowly release your foot and return to mountain pose. Repeat with the opposite side. Cobra pose is known for it’s ability to open, stretch, and flex the spine. In Cobra, our chests are open and our arms are strong. Cobra also works wonders on the lower abdomen. By strengthening the lower back, Cobra can help to relieve issues like sciatica, low back pain, and hip issues. Cobra also stimulates blood circulation throughout this area, improving menstruation and hormone balance. How To: Lie face down on your mat, with legs together and feet pointing towards the wall behind you and flat on the ground. Place your hand below your shoulders and spread your fingers to create a stable starting point. On an inhale, straighten the arms and lift the chest high while keeping your legs and pubic bone firmly on the ground. Open the chest further by reaching the shoulder blades back towards the spine. Rest here for 5-10 breath cycles. On an exhale, release and gently lower back to the ground, laying the face on one side and resting for a few breaths. Repeat at least 3 times. We often think of Child’s pose as a resting state. It is a safe place that we can return if we need a break, or a pose we can use if we want to calm down or ease our mind. Child’s pose also offers us a place of release. The form our body takes in child’s pose is one of relinquishing control and letting go. Use this pose if you feel you need help releasing something – perhaps a past event, a relationship, or even if you feel like you need to give up control of a situation and gain the courage to ask for help. How To: Begin by kneeling on the floor with your knees spread slightly wider than your hips and your bottom resting on your heels. Exhale and slowly lower your torso forward to rest in between your thighs. Place your forehead to the floor, and your arms down by your sides. Feel the stretch between your shoulder blades, then raise your arms up to rest outward in front of you to stretch the back and shoulders. Rest here for a few minutes. Considering the physical posture of Happy Baby, it’s no wonder this pose is a great hip-opener and beneficial for the low back and spine. What makes Happy Baby so special, though, is its ability to help you release and bring more happiness into your life. It’s a funny pose – laying there with toes to the sky, rolling around like a toddler – so smile or even laugh a little! Open up to more joy. How To: Start by lying on your back, then exhale and bend your knees into your belly. Grasp the outsides of your feet, hold on to your pinky toes, or use a strap. Open your knees and pull them towards your shoulders. Keep your ankles in line with your knees so as not to overextend them. Push your feet into your hands for resistance. You may choose to rest here or sway a bit to massage the back. As you rest here, smile or even laugh and embrace the silly nature of the pose. Savasana is our trusty closing pose for any yoga session. But Savasana is also a pose in its own right with more benefits than you may realize. Yes, Savasana is relaxing and calms the mind; it also improves self-awareness, perception, and focus. Spending time in Savasana after your yoga practice not only seals the session, but allows the body to integrate all the benefits of the previous moving practice. How To: Lay flat on your back with your legs extended. Release any tension in your muscles and allow your feet to turn out. Pull your shoulders down away from your ears and allow your arms to lay. Gently by your sides with palms facing upwards. Rest here for 3-5 minutes, or even longer for a more meditative experience. While these are all known (and lesser known) benefits of some of our favorite yoga poses, each asana offers a unique experience. Every person will have their own sensations and experiences with each pose and this may even differ from session to session. It is incredibly powerful to practice with an open-mind and listen to how your body responds to each pose. You may discover that a simple pose offers you a great sense of release or strength, or even opens your mind for inspiration in a way you would have never expected. Many of us practice yoga for a certain benefit – to find balance, strength, or peace. Yoga is a holistic practice and offers us so many benefits. Enjoy and embrace the expected – and unexpected – benefits of this amazing practice.